There is little doubt that the Kenyan and Ethiopian dominance will continue at the Marathon des Alpes-Maritimes Nice-Cannes, an IAAF Bronze Label Road Race, on Sunday (8). They have won each of the seven men’s titles on offer in the brief history of France’s second-biggest marathon, with four victories for Kenya end three for Ethiopia. 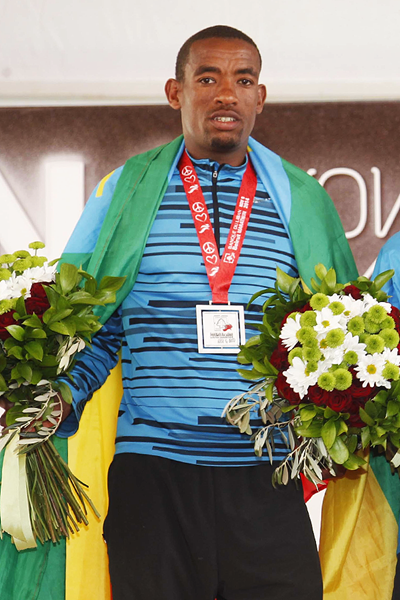 And although last year’s winner Shume Hailu of Ethiopia won’t defend his title, East African athletes will once again be the favourites for the eighth edition of the race this weekend. Plenty of candidates will be looking to take the title with seven athletes having PBs within one minute of each other. The fastest man in the field is Kenya’s Bellor Yator. The 31-year-old Kenyan – who briefly represented Qatar and went by the name of Yaser Belal Mansour – clocked a PB of 2:08:39 three years ago, one second faster than the Marathon des Alpes-Maritimes course record set by Lukas Manda in 2011. Yator wound up fifth last year at this race and was sixth in 2:14:50 in Geneva in May. It has been his only outing in 2015, likewise his compatriot Moses Kurgat who ran 2:15:43 when finishing ninth at the Ahmedabad Sabarmati Marathon in February. Kurgat is the second-fastest man in the field thanks to his 2:08:40 PB set in 2012 and knows the race as he stood on the podium in 2011. The 29-year-old Kenyan Barnabas Kiptum is also familiar with the Marathon des Alpes Maritimes Nice-Cannes as he was runner-up last year, setting his best mark of 2:10:29. Another Kenyan contender for victory is Victor Kipchirchir. He clocked 2:10:45 last month to finish second in Warsaw and has a PB of 2:09:13. He also comfortably beat Yator earlier this year in Geneva, clocking 2:13:14. But perhaps the favourite is Ethiopia’s Abdela Godana, despite being relatively inexperienced compared to others in the field. He has not yet run faster than 2:10, but he has the fastest season’s best of this year’s field as he clocked a PB of 2:11:37 in Barcelona in March in just his second outing over the distance. Other athletes with a chance of making it on to the podium include Kenyans Michael Kiprotich and Michael Chege and Ethiopia’s Tadese Aredo who all have sub-2:10 personal bests set a few years ago. In the women’s race, 36-year-old Rose Chepchumba will attempt to retain her title. Last year the Kenyan won in a personal best of 2:33:52, finishing 1:40 ahead of her compatriot Emily Rotich, who achieved her third second-place finish at the Marathon des Alpes-Maritimes Nice-Cannes. Chepchumba, who finished ninth at the 2005 IAAF World Cross Country Championships, has only run one race this year, finishing fourth at the Madrid Marathon in April in 2:37:36. Rotich may be hoping to break her streak of second-place finishes in this race, but her best this year is just 2:39:59, set when winning the Lyon Marathon last month. But Ethiopia’s Woynishet Girma has a better PB than the pair of Kenyans and looks to be the favourite. The 29-year-old has a best mark of 2:27:51 set in Amsterdam in 2010 and has run faster than 2:30 on four occasions. Sunday’s race will be her 19th marathon, but she hasn’t raced since December 2014 when she finished fourth at the Honolulu Marathon in 2:33:20. If she is in good form, the former Padua and Honolulu winner could improve the course record of 2:30:37, set in 2010 by Ethiopia’s Radiya Roba. Tigist Worku rounds up the field. The 31-year-old Ethiopian won the 2013 Bucharest Marathon in a PB of 2:37:28 and clocked 2:46:52 to finish second in Jerusalem in March. The race begins at the famed ‘Promenade des Anglais’ in Nice and then heads along the Mediterranean coastline going through the towns of Saint-Laurent-du-Var, Cagnes-sur-Mer, Villeneuve-Loubet, Antibes, Juan-les-Pins and Golfe-Juan before the finish line in ‘Le Boulevard de la Croisette’ in Cannes. More than 14,000 runners from 63 countries are entered in the various races over the weekend.